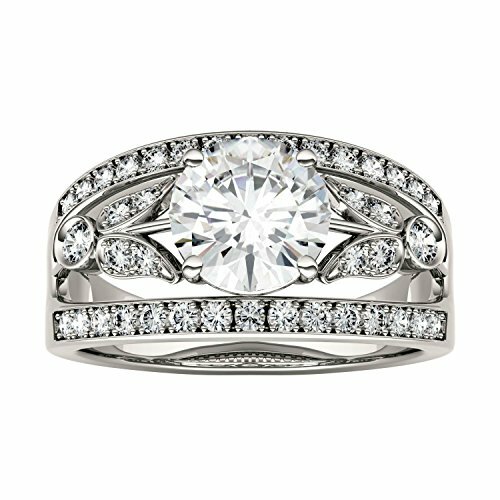 This charming Forever Brilliant ring showcases a 7.5mm, (2)1.6mm, and (38)1.3mm round brilliant cut moissanite gemstones. Beautifully crafted in rhodium plated 14K white gold and secured in a shared prong setting. Ring size 7. The primary 7.5mm gemstone has a Diamond Equivalent Weight (DEW) of 1.50ct (Actual Weight 1.35ct). The total Diamond Equivalent Weight (DEW) including all forty-one gemstones is 1.91cttw DEW (Actual Weight 1.68cttw). Charles & Colvard Forever Brilliant® is a near colorless gemstone in the G-H- I color range that is masterfully hand-faceted by skilled gemstone cutters and carefully hand-polished to reveal is maximum brilliance and enhance its intrinsic fire. This charming Forever Brilliant ring showcases a 7.5mm, (2)1.6mm, and (38)1.3mm round brilliant cut moissanite gemstones. Beautifully crafted in rhodium plated 14K white gold and secured in a shared prong setting. Ring size 7. The primary 7.5mm gemstone has a Diamond Equivalent Weight (DEW) of 1.50ct (Actual Weight 1.35ct). The total Diamond Equivalent Weight (DEW) including all forty-one gemstones is 1.91cttw DEW (Actual Weight 1.68cttw). Charles & Colvard Forever Brilliant is a near-colorless gemstone in the G-H-I color range that is masterfully hand-faceted by skilled gemstone cutters and carefully hand-polished to reveal its maximum brilliance and enhance its intrinsic fire. Moissanite created by Charles & Colvard is among the hardest minerals on the planet, more durable than sapphire, ruby, or emerald and has more brilliance than a diamond. It scores 9.25 on the Mohs scale for hardness. If you have any questions about this product by Charles & Colvard, contact us by completing and submitting the form below. If you are looking for a specif part number, please include it with your message.